There are probably a few things you didn't know about this flavor, like for instance, that it was created way back in 1929 by a William Dreyer, of Dreyer's Grand Ice Cream. The name "Rocky Road" was given to this flavor as it was supposed to spawn a smile to connoisseurs during the Great Depression. And, we now offer it in the most delicious way possible: as cheesecake. 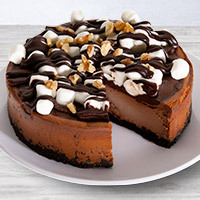 Our Rocky Road cheesecakes are downright sinful. 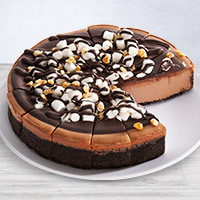 The top of our smooth, creamy chocolate cheesecake is coated with thick fudge and topped with marshmallows and walnuts - just like the original ice cream, only better.